Interested in training as a Trainee Nursing Associate Apprenticeship? 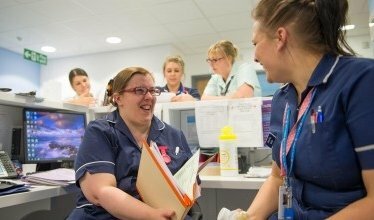 Are you a dynamic, enthusiastic and motivated individual who wishes to be considered to undertake an Apprenticeship Trainee Nursing Associate programme in March 2019? This is a new nursing role that will bridge the gap between the roles of the health care assistant and registered nurse. Open to SATH employees only. Employed as a health care assistant or similar health care role in Shrewsbury and Telford Hospital. The Apprentice Trainee Nursing Associate is a 2 year programme being developed in partnership with the Nursing Midwifery Council leading to qualification as a Nursing Associate. The programme will include placements in a variety of adult care settings both in SATH and external to the organisation. You will be studying with Staffordshire University from their Faculty of Health base at the Shrewsbury site. For further information and application process please access the Intranet Please contact helen.coleman@sath.nhs.uk or the CPF / PDN team on ext 3212.